We are glad to welcome you at the regular meeting of the Business Council at the Foreign Ministry of the Russian Federation. Today, we have agreed to discuss a range of issues related to ensuring effective political and diplomatic support for our companies’ operations abroad and bolstering Russian businesses’ positions in foreign markets. We began this discussion in July, at a meeting of ambassadors and permanent representatives of Russia attended by the Government’s ministers responsible for economic issues, the leadership of the Russian Union of Industrialists and Entrepreneurs, and representatives of major companies. We considered the priorities that we see in this area today at the plenary session devoted to economic diplomacy. I would like to once again thank everyone for their active, lively and informal involvement in that plenary session during Russian envoys’ meeting. I think it was very helpful for a clearer understanding of the current tasks. In addition to the Russian Federation’s Foreign Policy Concept, our foreign economic activity is still regulated by Presidential Executive Order On National Goals and Strategic Objectives of the Russian Federation through to 2024. This document stipulates the main targets such as the qualitative increase in non-oil exports and establishing Russia among the world’s top five economies. It is satisfying that Russian non-oil business is quite widely represented in the world today. Russian Railways is implementing a number of large projects in various parts of the globe, from South America to the Pacific Ocean. Kamaz products are highly valued both in the CIS and in Africa and Asia. Phosagro remains the main supplier of fertilisers in the Indian, South American and other markets. The supply of agricultural products and food is increasing. There is also a growing demand for Russian engineering products. Understandably, we must keep in mind that competition in foreign markets will continue to increase, while the unprecedented pressure on Russia will also continue. As you know, the most unfair business practices are being used against us, including the extraterritorial application of national legislation. Their goal is clear; President of Russia Vladimir Putin spoke about this more than once. They want to oust large Russian companies from their markets, to limit our foreign economic activity, and ultimately – this was all but said out loud, with no attempt to hide it – to try to contain our country’s socioeconomic development. We can see that the United States is showing special zeal for that. Blackmail and ultimatums have already become Washington’s hallmark – not only with regard to Russia, but also their own allies. It is clear that in these conditions we must continue to enhance our interaction with our partners and like-minded people in the EAEU, SCO, BRICS, and other colleagues. We must make maximum use of the opportunities arising from our country's participation in various integration projects in the Asia-Pacific region, the new locomotive of the global economy. The most recent ASEAN meetings with its partners, which took place in various formats in the last two days in Singapore, have revealed enormous opportunities here. We must certainly continue our energetic efforts to further build on the geographical diversification of Russia’s foreign economic relations, primarily through the deepening of cooperation with other Asian countries, as well as South America and Africa. Russian embassies in these countries are counting on companies’ increased attention to dynamic markets and regularly make specific proposals on this score. We can see that these proposals are of increasing interest to Russian economic operators. It is also important to continue working to expand payments in national currencies in trade operations. At multilateral platforms, including the United Nations, G20 and WTO, we continue to point out the negative impact of sanctions on the modern global economic order based on the principles of free trade and fair competition. It is obvious that our approaches are shared by the overwhelming majority of members of the international community. In our dialogue with Western countries, we will continue consistent efforts to depoliticise trade and investment ties. This concerns our relations with Europe and the United States. Moreover, European officials understand that the confrontational policy towards Russia is counterproductive, and do not want to suffer multibillion-dollar losses as a result of a downward spiral of sanctions. The current agenda includes the early completion of the transfer of management of Russian trade missions to the Ministry of Industry and Trade, as well as improving inter-agency coordination, including to avoid duplication of functions. Further modernisation of trade missions that have proven to be effective, especially in developing countries, is highly relevant. We are also discussing with the Economic Development Ministry the possibility of increasing the number of its foreign offices as part of our Embassies. We will continue to render all possible assistance to various initiatives and undertakings of our economic operators abroad. At the same time, it is obvious that the most important component of success is business leaders’ own energetic work and initiatives coming from them, because they know better than anyone else the advantages of certain countries and projects. In the highly competitive modern world, to achieve tangible results, it is not enough to offer quality goods and services. It is important to work creatively and to take the initiative, to combine efforts, to concentrate resources in breakthrough projects and, importantly, to increase information support for their activities. We will make every effort to help you in these initiatives. I expect that in the course of this discussion we will thoroughly consider these and other topics that are of interest to you. 757: 30 seconds to mars. 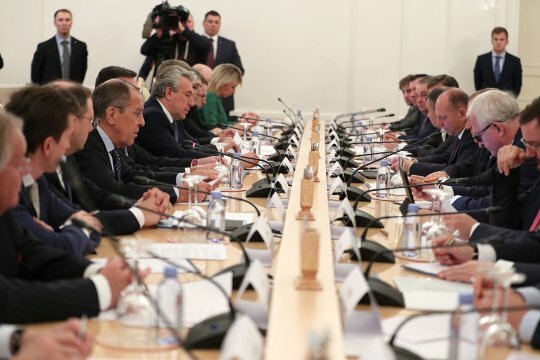 Foreign Minister Sergei Lavrov’s remarks at a meeting of the Foreign Ministry’s Business Council, Moscow, November 16, 201820 November 2018: Foreign Minister Sergei Lavrov’s remarks at a meeting of the Foreign Ministry’s Business Council, Moscow, November 16, 2018! лучшие комедии. Foreign Minister Sergei Lavrov’s remarks at a meeting of the Foreign Ministry’s Business Council, Moscow, November 16, 2018.